MICHAEL B. TITOWSKY has worked exclusively in the civil litigation field since his graduation from law school. He became associated with Morris Duffy Alonso & Faley in August of 1993 and became a partner in 1997. 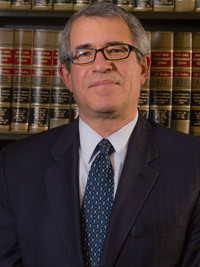 Michael Titowsky has obtained numerous defendants’ verdicts and dismissals at trial in premises, motor vehicle, general liability, labor law and medical malpractice cases in all five boroughs. Mr. Titowsky has published legal articles in The Torts Insurance and Compensation Journal of the New York State Bar and has also lectured on various topics at insurance companies and bar associations. More recently, he has lectured extensively on bad faith claims in New York. Mr. Titowsky is married to Jeannette B. Price and has two daughters. He lives on the Upper West Side of Manhattan, where he is active in youth sports programs, including the West Side Soccer League and the West Side Little League. He is a certified (AYSO and USSF) soccer referee and referee instructor. Defendant’s verdict in premises case where business owner allegedly provided defective ladder for plaintiff.